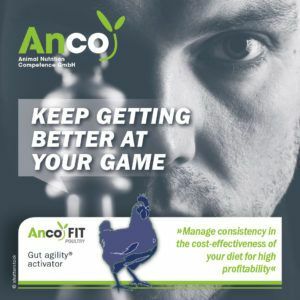 Poultry production is highly competitive and it is not getting any easier with consumers and key restaurant chains increasing the demands for the reduction of antibiotics in poultry feed. Poultry producers must keep getting better at their game – respond faster to challenges and drive production and cost-efficiency. In a fast-moving business environment, operational agility becomes key to profitability and success. Feed is a major production cost and there are two ways to approach it: Minimize the cost of feed or maximize the return on investment. The latter is much easier said than done. Despite animal nutrition becoming increasingly more sophisticated, we are likely to still be far from maximizing the return on investment of feed. This is because there are still difficult to control or unknown factors present in feed that can affect performance. There is also a lack of a full understanding of how birds respond to the many different factors of feed and how this can be influenced positively in diet formulations to maximize returns. With at least 70% of production costs coming from the cost of feed, consistency in the cost-effectiveness of diets is key to profitability. However, nutritional stressors in the diet, such as dietary changes, reduced nutrient digestibility, endotoxins, anti-nutritional factors and mycotoxins, often throw a spanner in the works of consistency in performance in response to diets. Depending on the increased presence or absence of those stressors the same diet can differ in cost-effectiveness. These stressors are often not easy to control for the nutritionist and are part of the reality that animals are facing in modern production systems. When challenged with nutritional stress factors, stress reactions such as oxidative stress, leaky gut, inflammation and shifts in gut microflora will be triggered in the bird. This will not only reduce growth performance, but also feed efficiency and thus the cost-effectiveness of diets. Feed efficiency is reduced due to energy wasted on stress reactions instead of being used for productive purposes. Ideally the response to nutritional stress factors should consume as little energy as possible or stress reactions should be minimal for better and more consistent feed efficiency. This would be the case if animals would be inherently more resistant to nutritional stress factors or would be able to adapt to nutritional stressors more energy efficiently. Applying the concept of agility to the bird can help to further develop efficiency in poultry production. The gut and the immune system are particularly responsive to stressors, hence why the emphasis is on the gut when improving the animal’s adaptive response. Gut agility is a new term coined to describe the bird’s ability to adapt to nutritional stressors in a faster and more energy-efficient response than it normally would. What sets star performers apart from the rest? They are constantly looking for ways to improve their performance for competitive advantage. Their biggest competitor is their own performance from yesterday. They continuously measure and track their own performance and keep raising the bar in the high standards they set themselves to keep getting better at their game. Poultry producers are continuously having to find ways to improve the efficiency of production despite consumers somewhat hampering their game. Successful poultry producers are smart enough and their operations are agile to adapt to new challenges and changes in their business environment quickly.